We welcome back Rehkopf and Michel to the stage performing with the Conservatory Orchestra under the direction of Maestro John Welsh. The duo are artists in residence at Central Washington University where they teach. Both have an eclectic career as soloists and chamber musicians. They have returned to perform with Welsh for his final season with SOGO before retiring the baton in May. 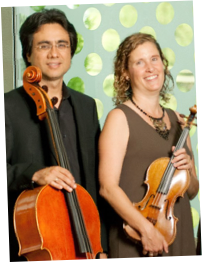 The duo will be featured in the Concerto for Violin and Cello with Orchestra by Brahms and the Conservatory will also perform Respighi’s Pines of Rome. The Brass Choir, directed by Greg Allison, will perform Gabrieli’s Canzon XII, Bach’s Wachet Auf, and Joplin’s Bray Elite.